Sorry... the 2017 Nissan Rogue Sport is no longer being sold as new. Instead, take the first step to a great deal on 2019 Nissan Rogue Sport with a free price quote! 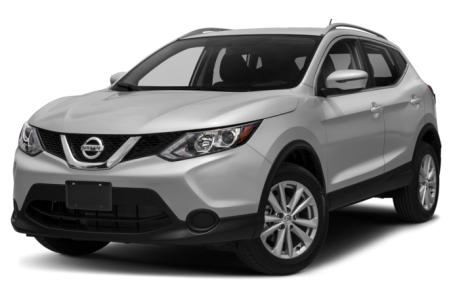 The 2017 Nissan Rogue Sport is an all-new, subcompact SUV that seats 5 passengers. It competes with the Mazda CX-3, Honda HR-V, and Toyota C-HR. Three trim levels are available: the S, SV, and SL. Although they share similar names, the Rogue and Rogue Sport only bear a slight resemblance. While the Rogue maintains bold, geometric appearance, the Rogue Sport opts for more proportional, aerodynamic styling. The frontend features a shorter V-shaped grille, angular headlights with LED daytime running lights, and a flared lower fascia. The Rogue also continues the trend of black-clad, underbody trim like other SUVs. Standard features include power side mirrors, a rear roof spoiler, and 16-inch wheels. Larger 19-inch alloy wheels and LED turn signal indicators at the side mirrors are available as well. Inside, the Rogue Sport has a cloth interior with a 60/40-split folding rear seat. Maximum cargo capacity is 61.1 cubic feet with the rear seat folded down. The center stack features a standard multimedia system, which includes a 5-inch color display, CD/MP3 playback, Siri Eyes Free mode, Bluetooth connectivity for phone and audio, a USB port, and four speakers. It can be upgraded to the NissanConnect system that has a larger 7-inch touchscreen, navigation, a mobile app suite and services, and six speakers. Standard features include power windows/locks, cruise control, air conditioning, and rear HVAC. Leather upholstery, remote keyless entry, and keyless push-button start are also available. Powering the Rogue Sport is a standard 141-hp, 2.0-liter 4-cylinder engine mated to a continuously variable transmission (CVT). Front-wheel drive comes standard, while all-wheel drive is available. Fuel economy for FWD model is 25/32 mpg city/highway. It lowers slightly to a rating of 24/30 mpg for the AWD model. Standard safety features include a backup camera and a tire pressure monitoring system. Around View Monitor, a blindspot monitoring system, rear cross traffic alert, lane departure warning, pedestrian detection, and automatic emergency braking are available as well. 35 of 35 (100%) consumers said they would recommend this vehicle to a friend.